Prestobul Max is available in 400 ml aerosol cans. It is a leak detector for refrigeration and air conditioning installations, as well as systems containing a refrigerant or pressurised gas. Heated diode sensor. 3 sensitivity levels, suitable for all fluids CFC's, HCFC's, HFC's and HFO's, leaks signalled by audio alarm + LED, battery or mains powered. With measurements every two to three seconds, the DNI conducts full leak detection, continuously. Tested on a panel of well-adjusted positive and negative installations in superstores and hypermarkets, the DNI permitted a 79% saving in refrigerant compared with traditional detection (Ademe report of February 2011), with a return on investment of less than a year. In the event of a leak, an alert is triggered and the operator is warned by local alarm and email so that action can be taken as quickly as possible. Installing a DNI reduces the frequency of leak detection (according to EU Regulation no. 517/2014 Art.4). The MGS 150 is a refrigerant leak detector for air conditioning and refrigeration (eg chillers, supermarkets, industrial refrigeration). MVR-300 is a new refrigerant detector for occupied spaces to enhance safety, legislation compliance and HVAC efficiency. By ionisation. Highly sensitive (3 gm/yr). 7 sensitivity levels, suitable for all halogenated fluids, battery powered. Creates mini leak of 5 gm/yr of R-134a so that the user can conduct on-site checks of portable leak detectors before searching for any leak. 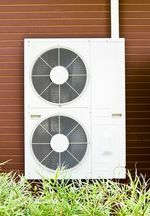 detection of refrigerants for air conditioning and refrigeration installations (chillers, GMS, industrial refrigeration).